Pasta sauce is the ultimate veggie vehicle. I just love how you can sneak in all sorts of delicious vegetables & not even notice. Not that vegetables need hiding, but hey you might as well bump up the nutrients in your pasta sauce if you can! Finely chopped mushrooms blend particularly well with bolognese sauce. When the cook down, they look just like the little chunks of ground beef, so you can’t even tell they’re in there! I use regular white button mushrooms since they have the mildest flavor. It’s a great way to add more fiber and some vitamin D to your meal. Finely diced carrots also cook down to a nice soft texture, and the bright orange color blends in with the vibrantly red tomatoes. 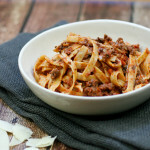 The result is a thick and hearty bolognese sauce that coats each strand of noodles and is absolutely packed with flavor. How good does that look?? 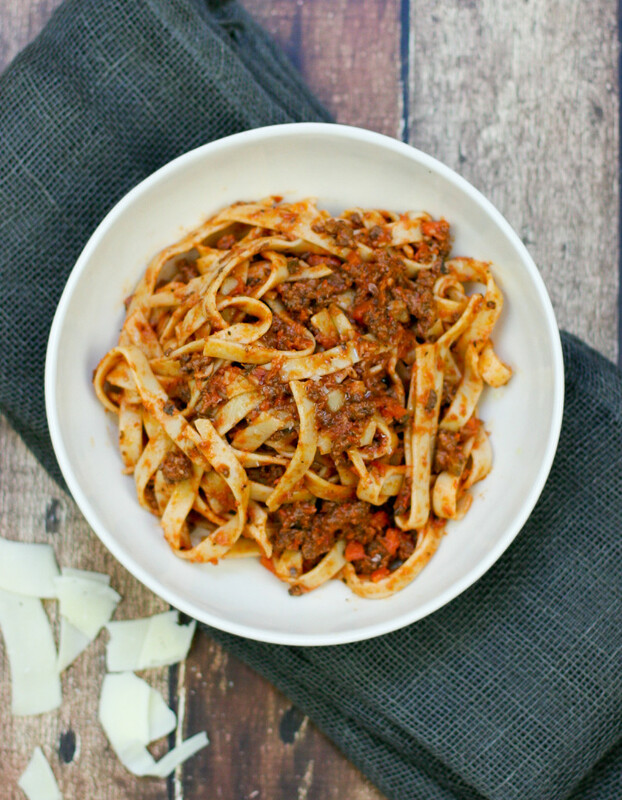 This recipe is for a quick and easy weeknight bolognese. 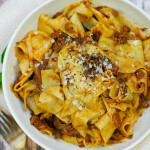 Sure, a true bolognese that simmers for hours on the stove is what dreams are made of, but that’s not super realistic for a weeknight. 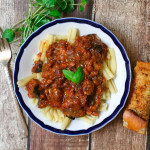 Luckily, you can still get a rich and complex sauce in under 30 minutes by using dried herbs, high quality canned tomatoes, tomato paste, and red wine. 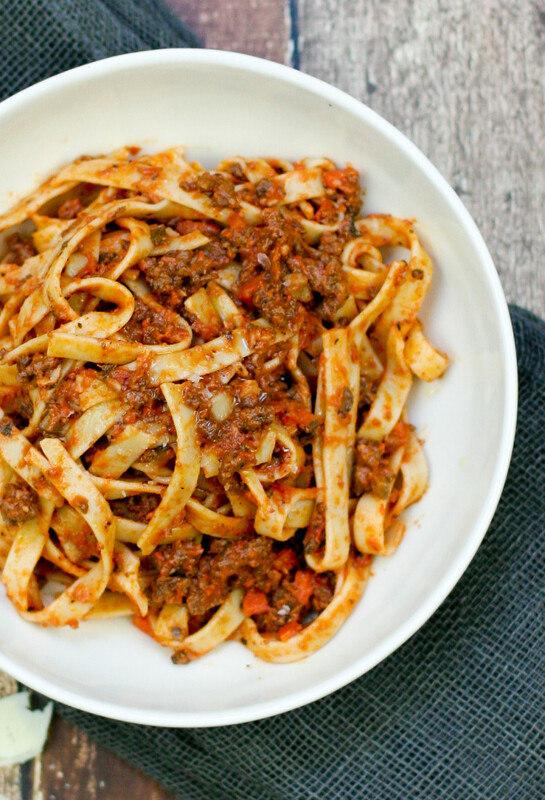 I love this meaty sauce tossed with thick fettuccine noodles, but feel free to use whatever noodles you want. This meal is a crowd pleaser, and also makes great leftovers – the flavors deepen as it sits. Heat the olive oil in a large nonstick skillet. Add the ground beef and saute for about a minute, breaking up with a spatula as you stir. Once the meat is broken up and just starting to brown, add the mushrooms and carrots and continue to cook until the meat is nicely browned and there are no liquid juices left in the pan. While the meat browns, bring a large pot of salted water to a boil. Next, add the garlic, oregano, basil, red pepper flakes, and tomato paste to the pan with the meat along with an extra splash of olive oil. Saute for about a minute, stirring, until the garlic is nice and fragrant. Add 1 cup of the red wine, the tomatoes, salt, and pepper to the meat mixture and stir to combine. Let simmer uncovered for 10 minutes. Meanwhile, add the fettuccine to the boiling water and cook according to package directions until al dente. When the pasta is done, drain and lightly toss with a drizzle of olive oil to prevent it from sticking while you finish the pasta sauce. To finish the sauce, stir in the nutmeg, heavy cream, and 1/4 cup wine. Let simmer for about 5 minutes to allow the flavors to meld. Turn off the heat and stir in the Parmesan cheese. 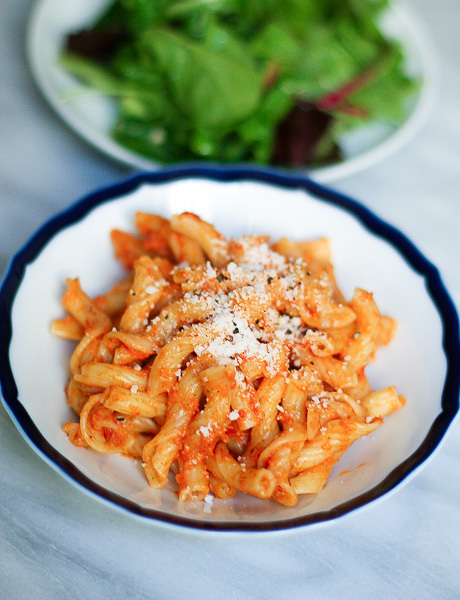 Serve up the pasta into bowls, top with the bolognese sauce, extra Parmesan cheese, and salt and pepper to taste. Enjoy! Inspired by Ina Garten’s Weeknight Bolognese recipe.